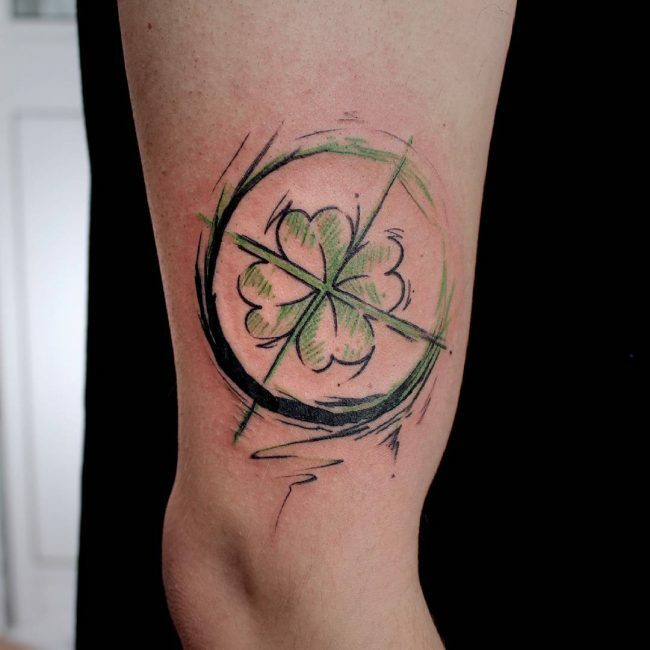 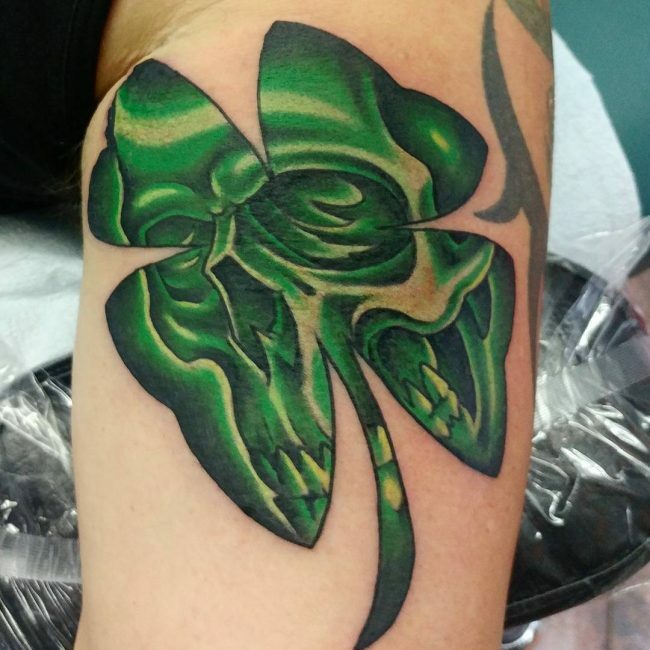 Four leaf clover tattoo is among the most used designs in the field of tattooing and the favorite for many men. 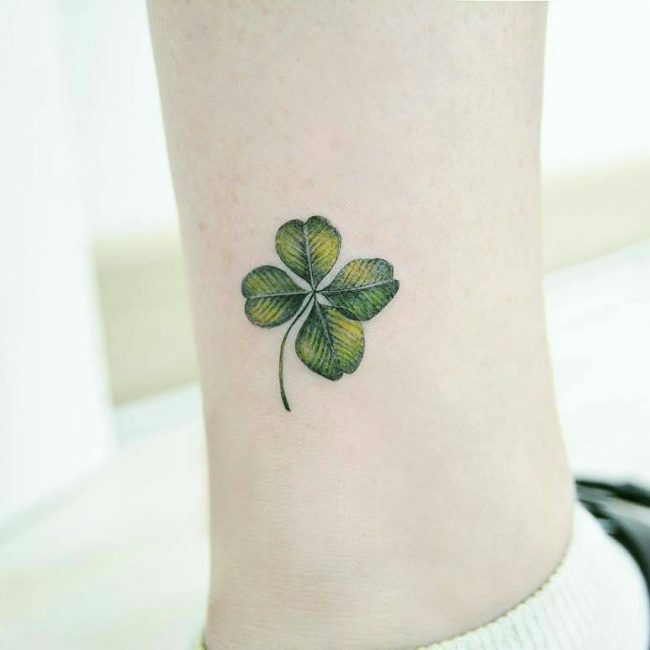 The design is very elegant and it is believed to symbolize good luck. 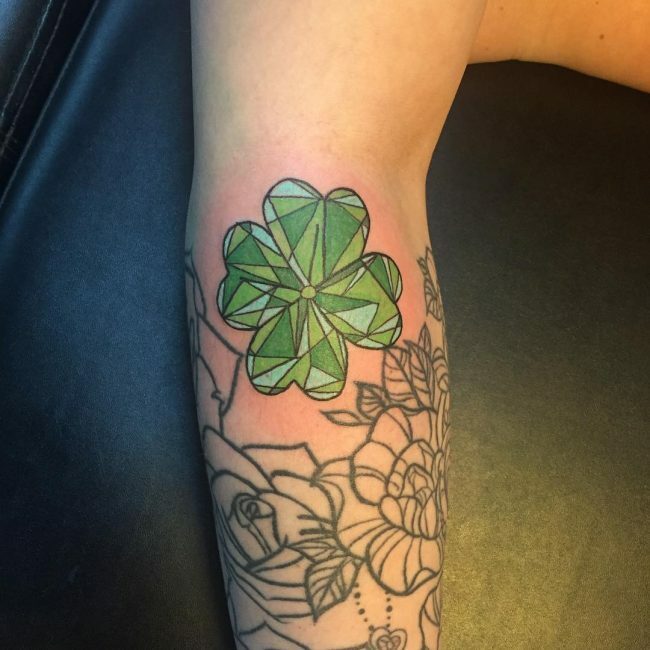 The meaning of this design is derived from the clover leaf that has been associated with good luck because of the fact that it is rare to find it. 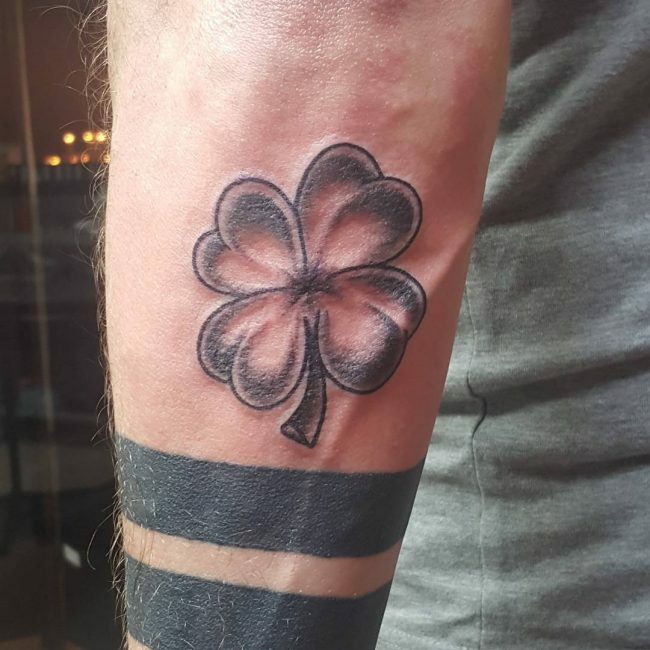 Many men prefer having this deign as a tattoo because it not only make them look cool but they also believe it can bring them some luck. 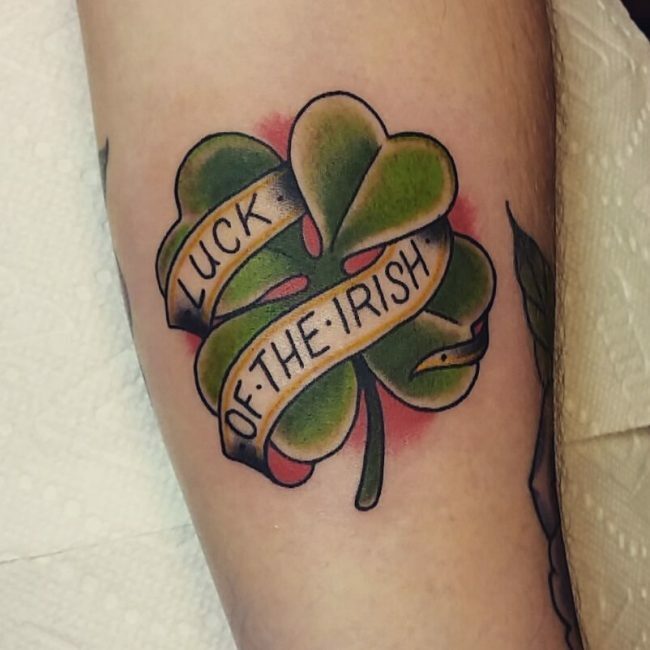 This type of tattooing is believed to have originated from Ireland during the 5th century before spreading to other parts of the world. 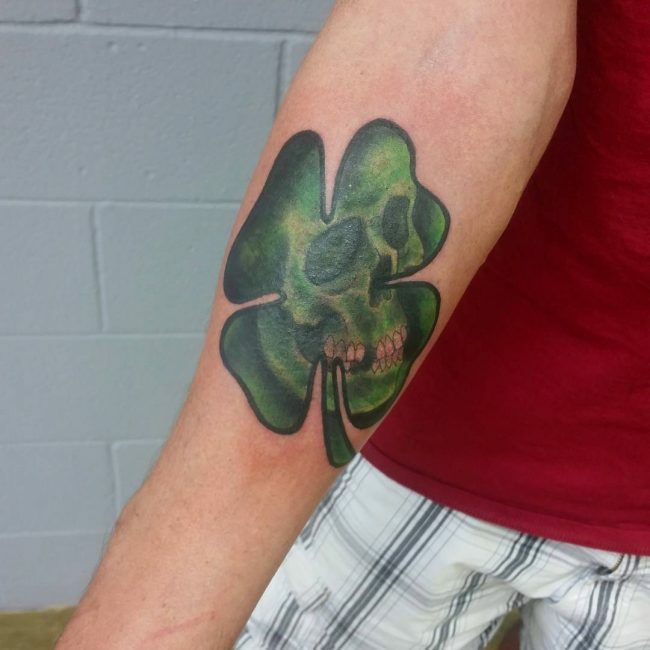 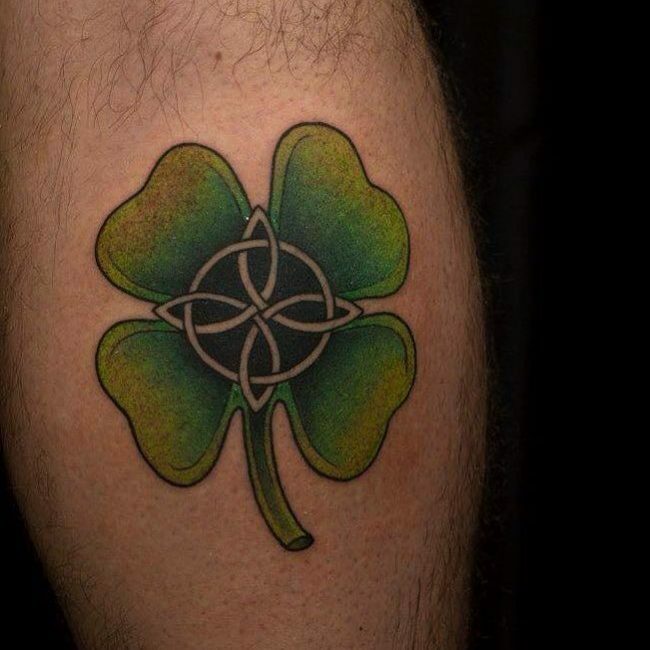 The design is closely associated with St. Patrick because he was introducing Christianity to the world the same time the tattoo was establishing its reputation. 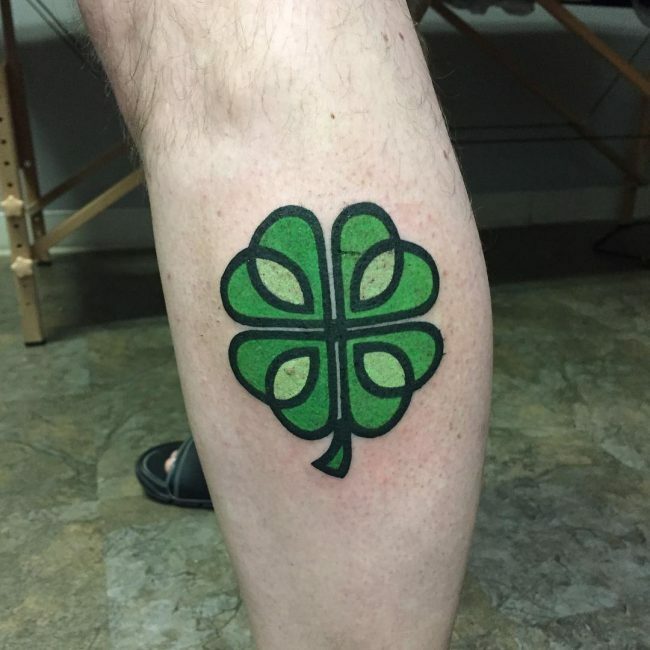 Initially, Clover represented the Holy Trinity and St. Patrick used this meaning and its abundance in the countryside to express his zeal for religion with the people. 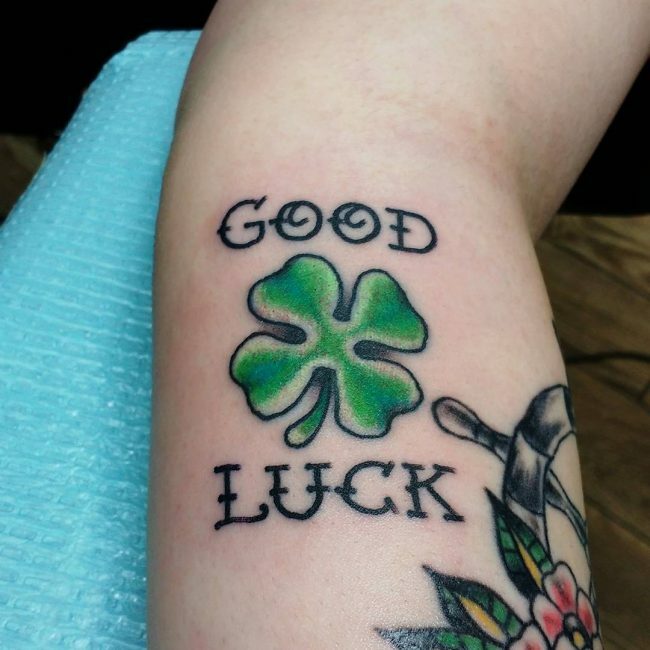 The notion of good luck was introduced somewhere in between the St. Patrick and the future generation. 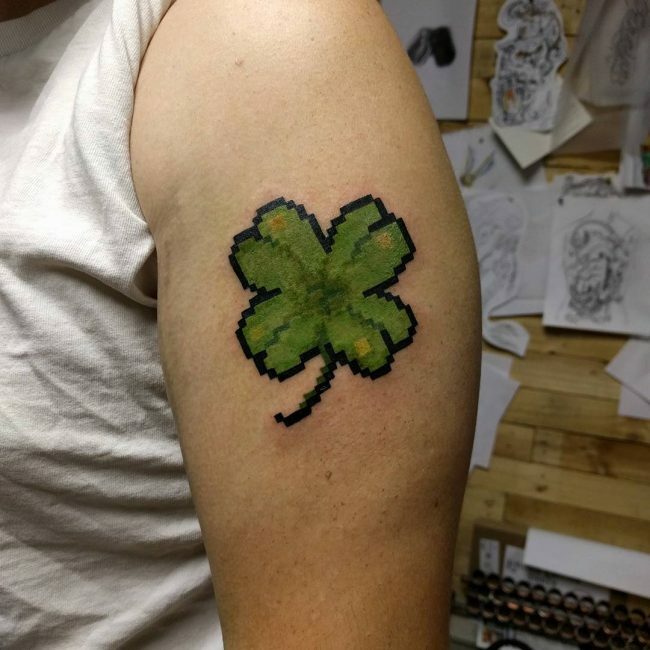 Anyone in possession of the rare Clover plant leaf was believed to have some instant good luck and many people started drawing its images on their body to symbolize the same. 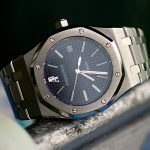 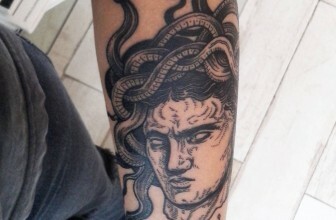 Although men in the modern world use the tattoo for different meanings, there is still some connection with its ancient meaning. 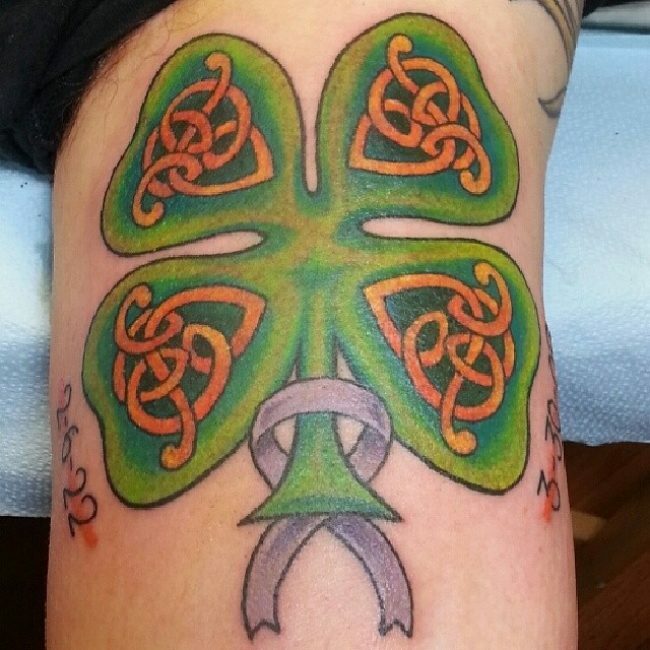 The Christian men use this type of tattooing to represent the idea of the holy trinity (the Father, the Son, and the Holy Spirit). 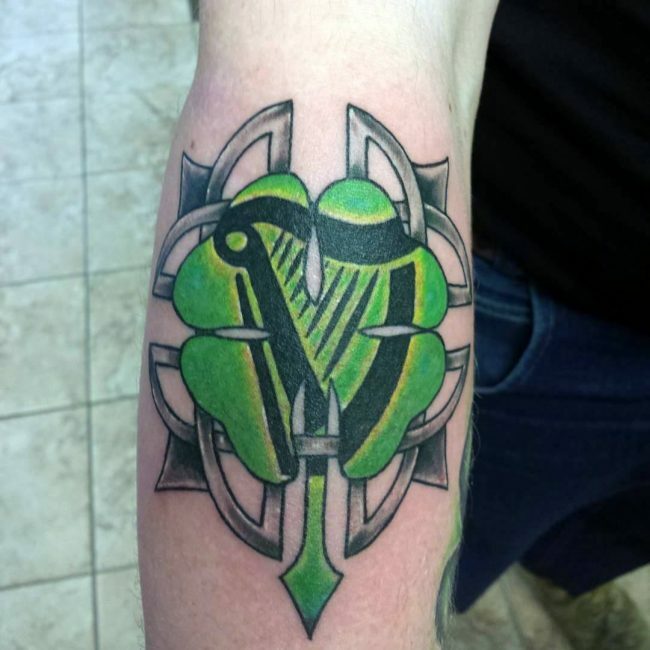 Some Christian men use the design to represent their preference for hope, love, and faith. 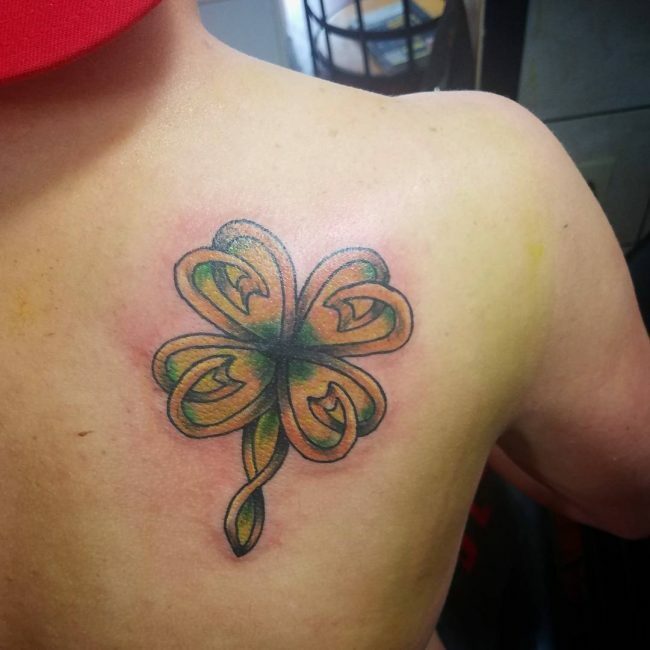 However, the majority of the men who have this tattoo design drawn on their body use it as a sign of good luck. 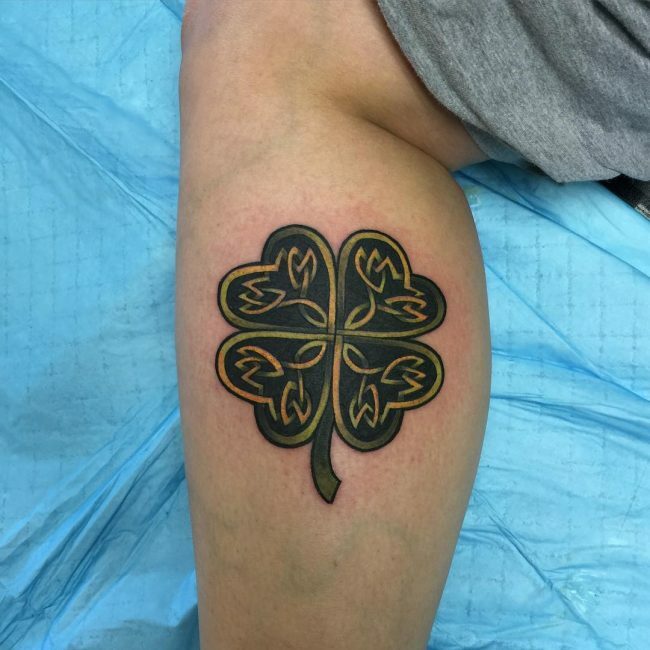 There are those who use it to symbolize the four core virtues such as love, hope, luck, and faith. 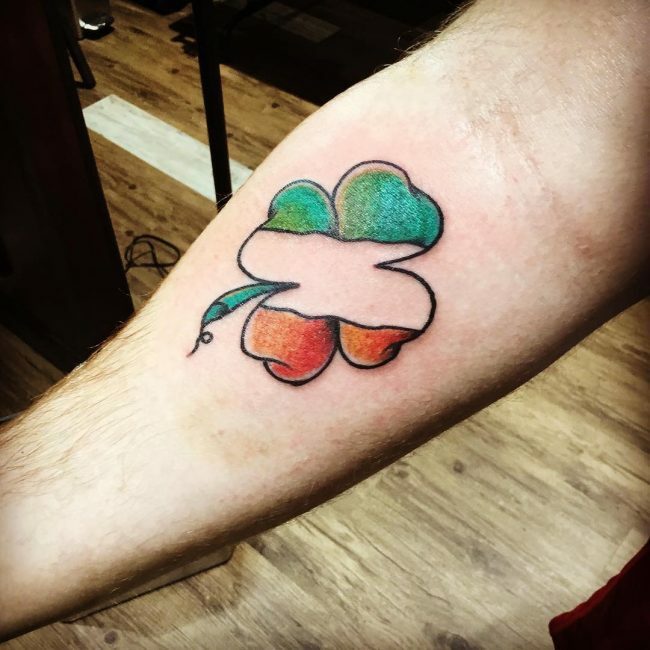 Each of the segments of the leaf symbolizes each virtue and the whole leaf is used as a common symbol of life. 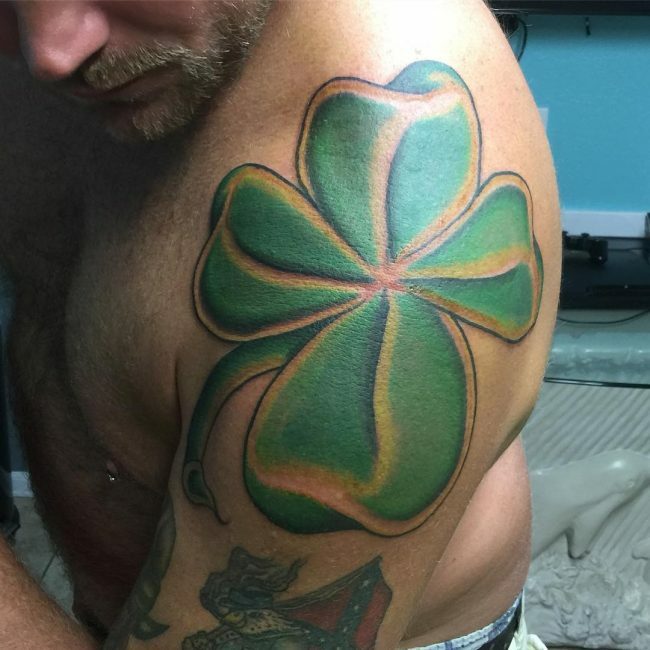 Some men also have the four leaf clover tattoo drawn on their body as a way of enhancing their looks. 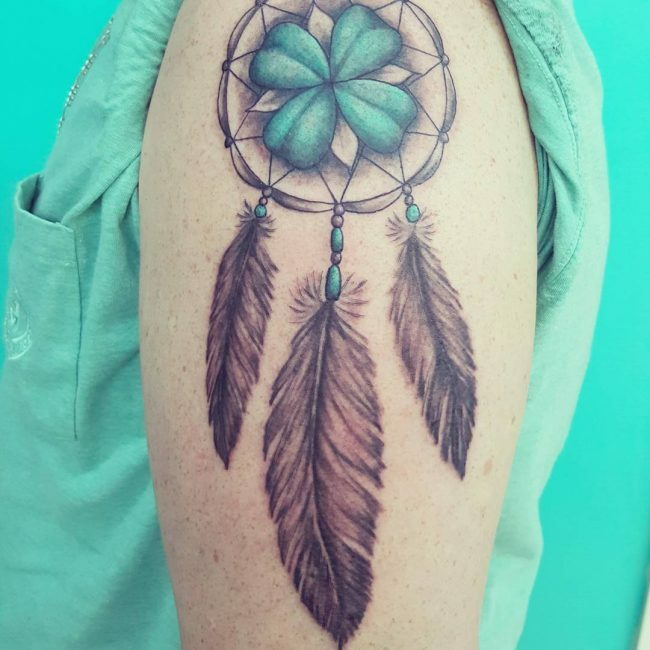 The design is unique, original and different colors can be combined together to make it even more attractive. 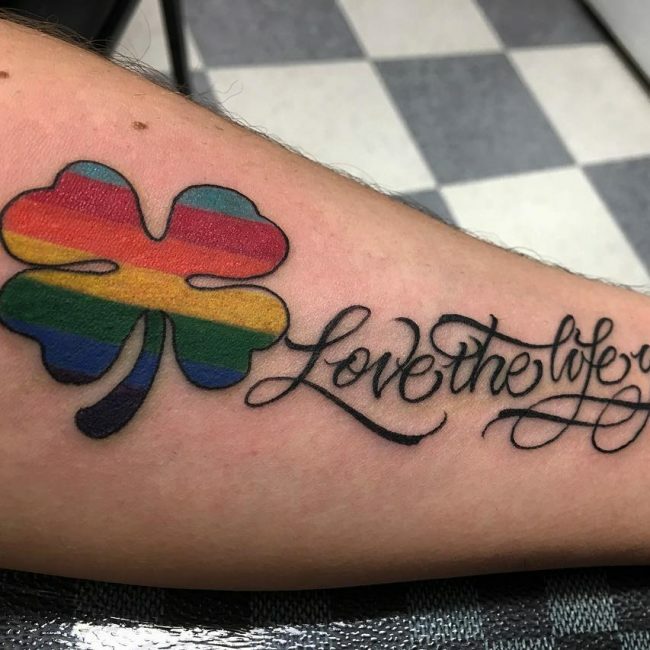 Men from the same family can also use this tattoo to symbolize love and unity. 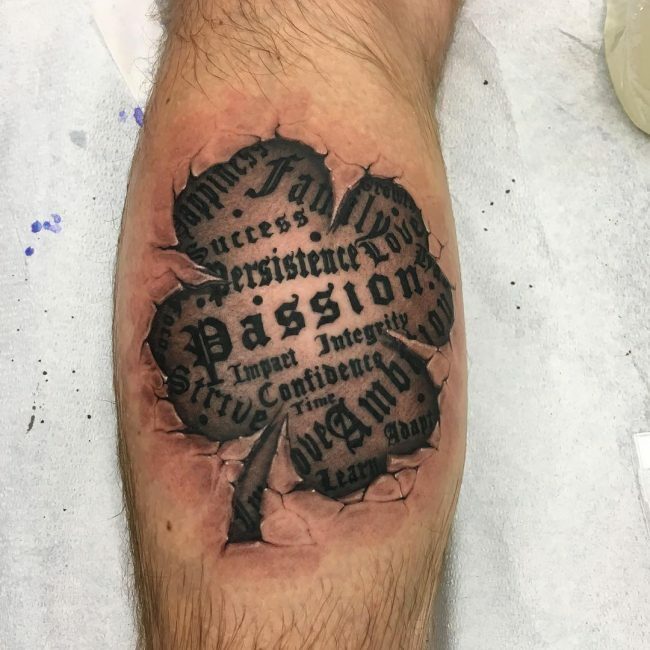 Generally, this type of tattooing has the most special and positive meaning as long as it is not used together with other symbols that could distort its meaning. 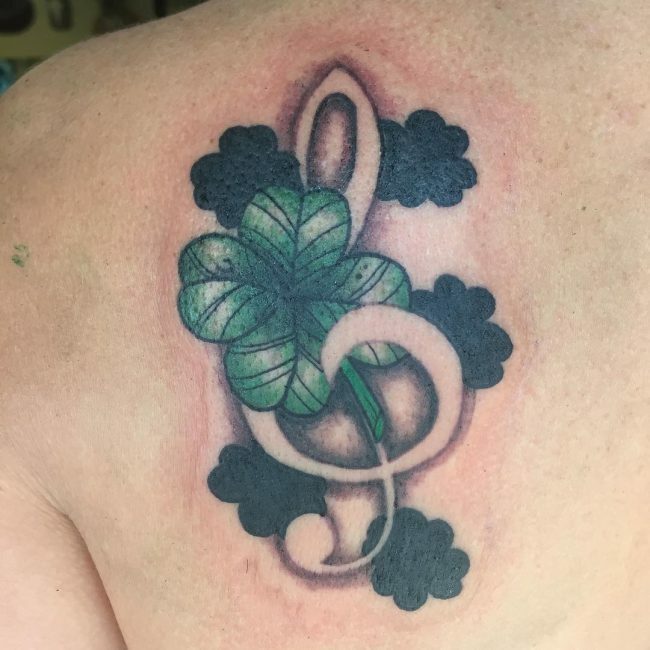 Just like other tattoos, this design has no specific part of the body where it should be placed and you can have it drawn anywhere you wish. 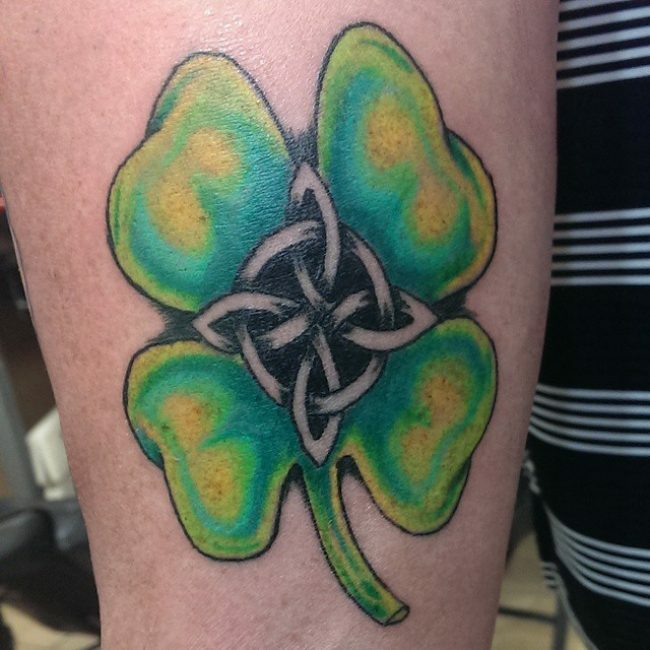 However, the size of the tattoo and other details might make it necessary to consider where you want to have it. 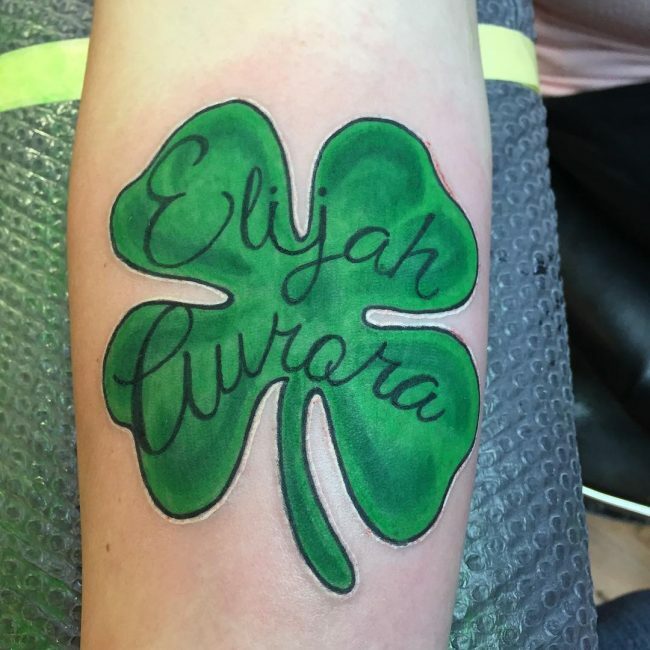 For instance, if the tattoo is too large, you can have it drawn on the arm, side or the back. 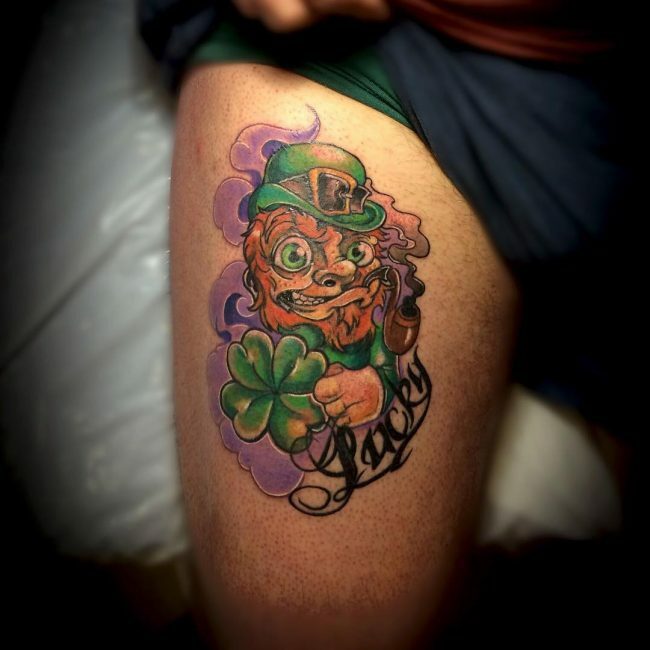 The tattoo also looks amazing when drawn on the thighs stretching downwards. 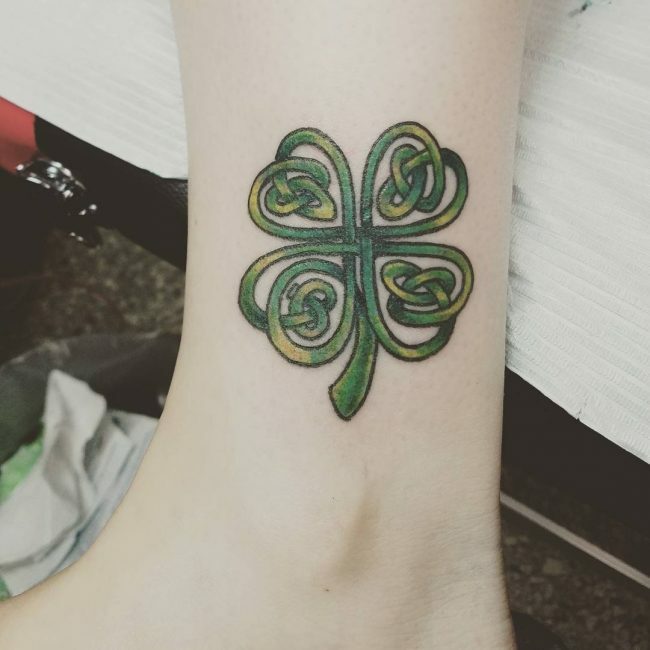 On the other hand, if you want a small sized tattoo, you can have it drawn on the wrist, back of the ear, ankle, neck, and fingers. 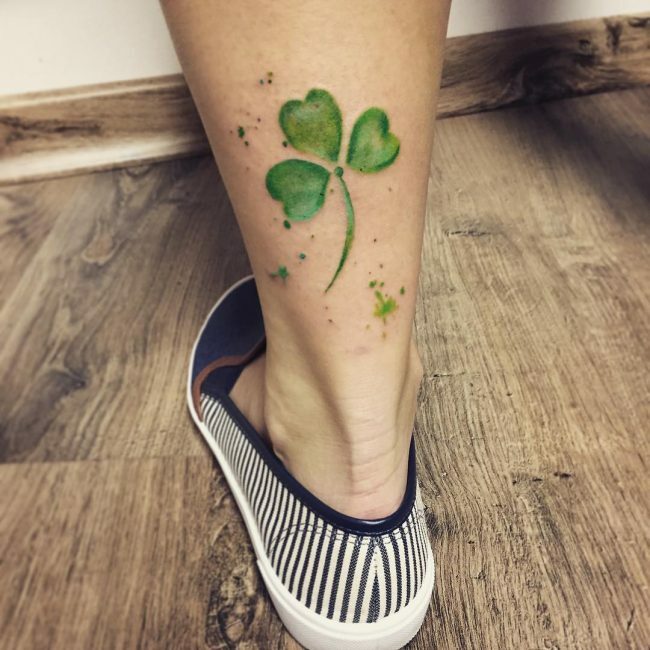 However, there is no restriction where to have it and you are free to choose your ideal part of the body for its placement. 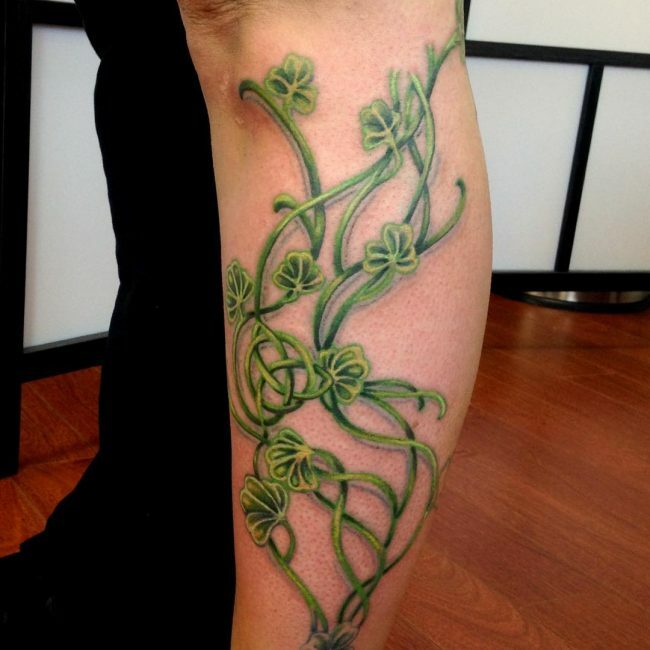 The idea is to try as much as possible to have it drawn to the area that will make you look elegant. 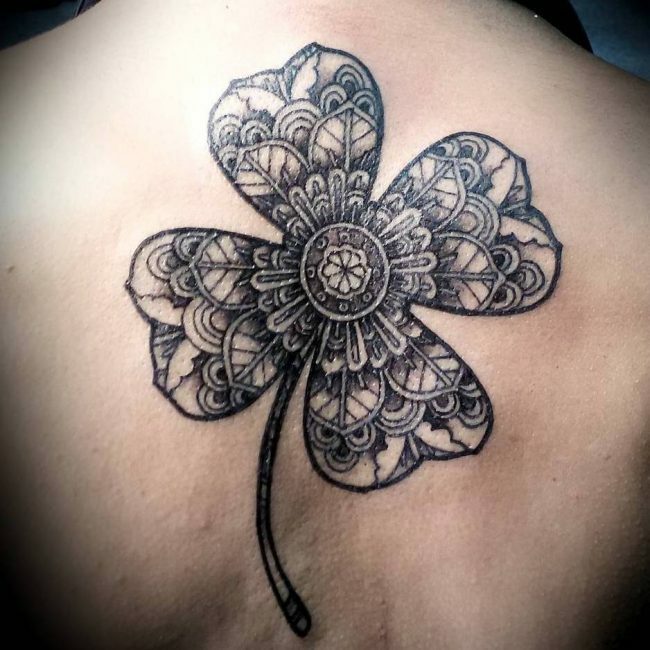 Whether you want the tattoo as something private, or where people can see also determines where to draw it. 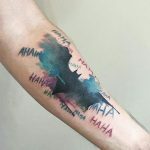 The one with characters: Some men prefer adding characters in this type of tattoo to make it more meaningful. 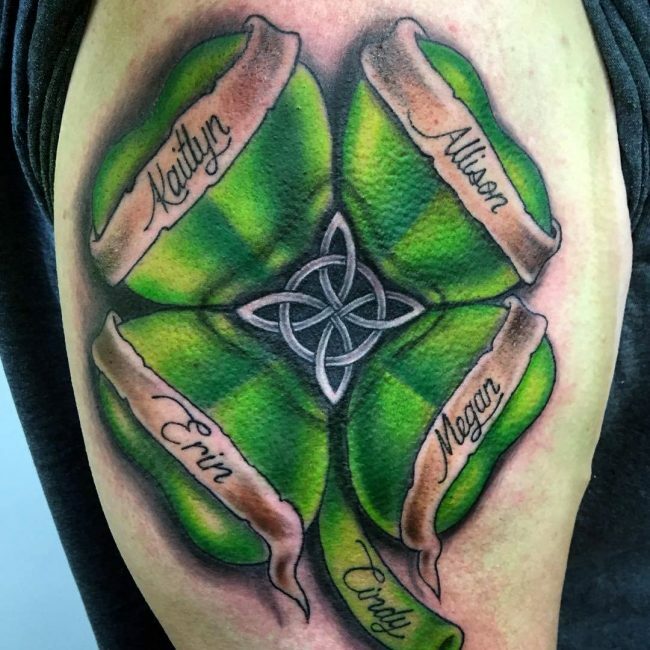 You can choose some characters and symbols to be included in the image, but you need to make sure you understand their meanings. 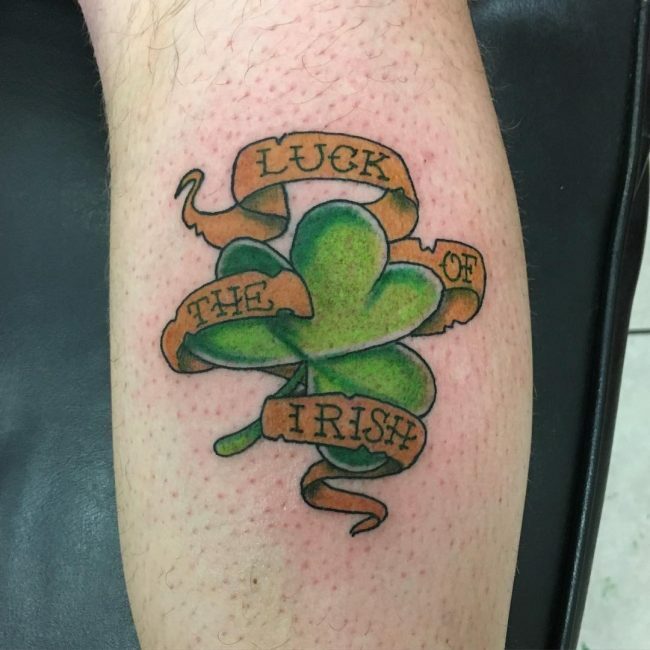 It is also important to make sure that the characters you choose do not distort the original meaning. 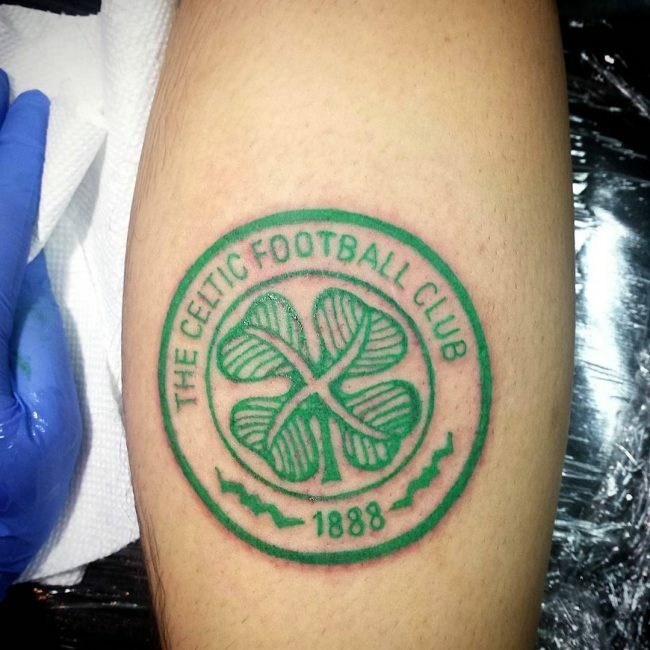 The Celtic design: This is believed to be the most original and commonest among all. 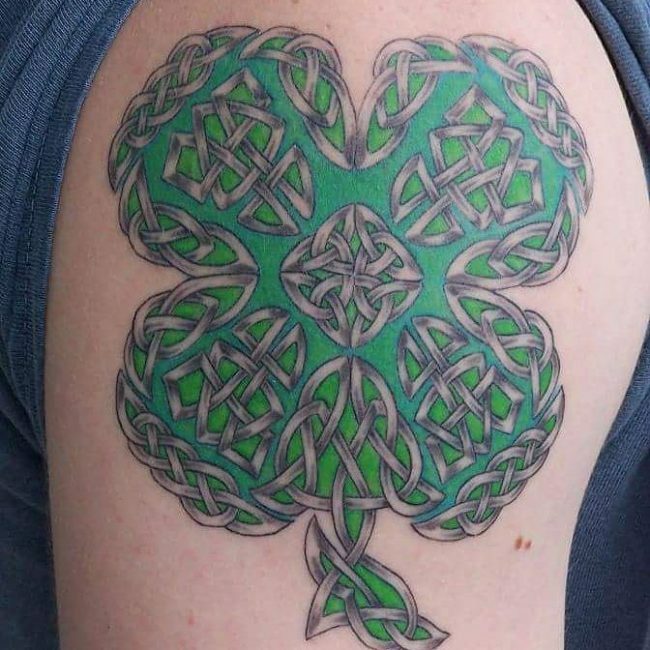 The tattoo consists features similar to those of the Celtic cross or the Celtic tree of life. 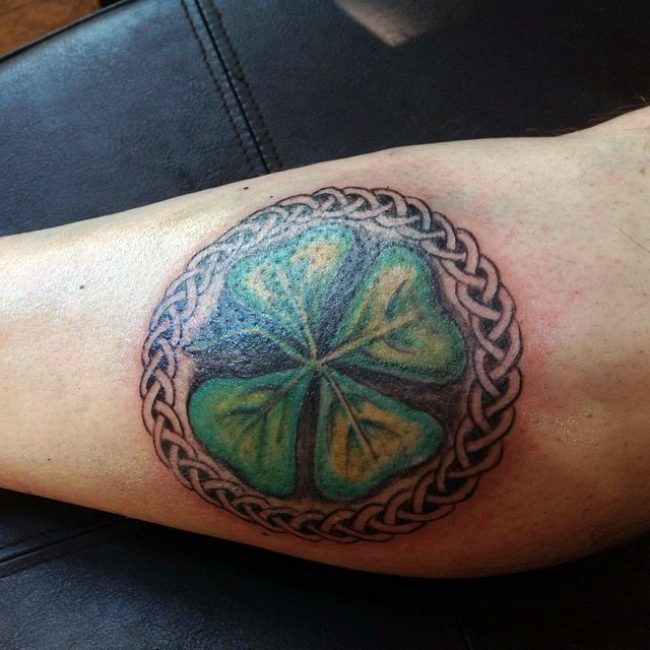 This design has a green theme and is the most suitable for men who want to have a tattoo with the Celtic theme. 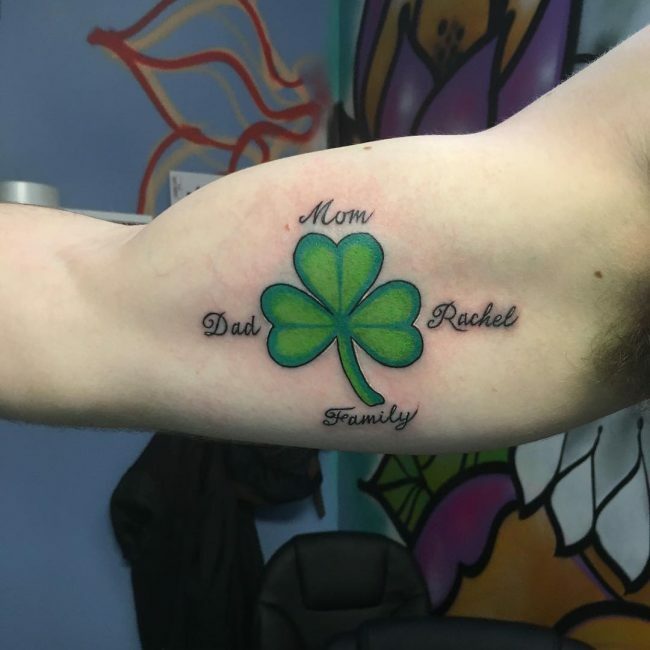 The family tattoo design: This design comes with a different symbol of a family. 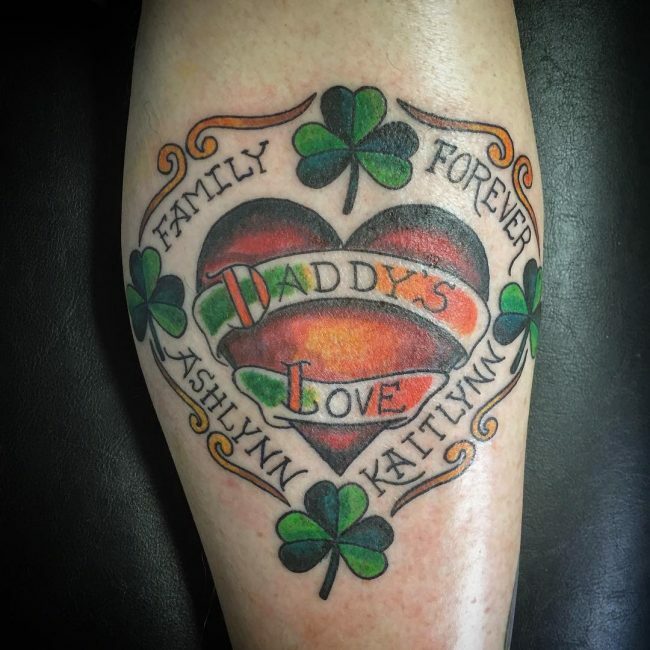 The family can be made up of blood-related members or a common unit of dedicated members of a certain group. 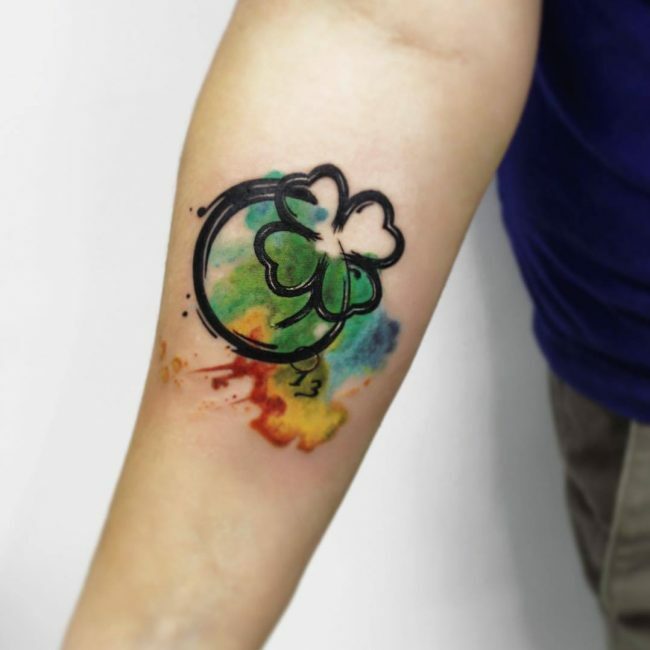 However, for the group tattoo design, the image may vary depending on the intended meaning of the members of that group. 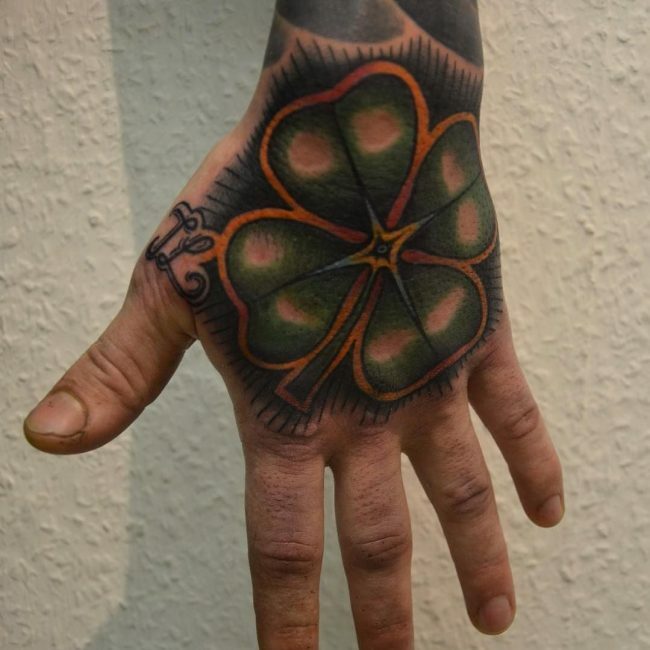 Generally, men from a certain group with similar affiliation use this design as a sign of unity and to show that they have a particular fortune in doing something. 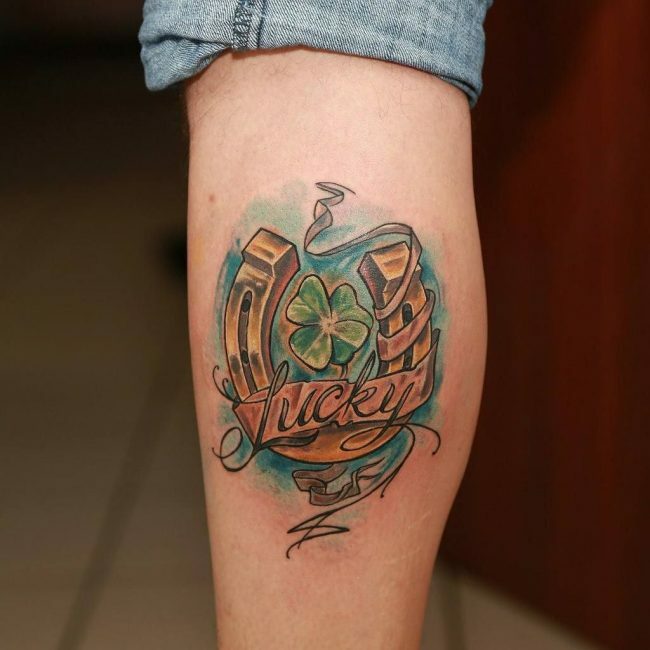 Gambling design: Gamblers also use the design of tattooing to enhance their luck when gambling. 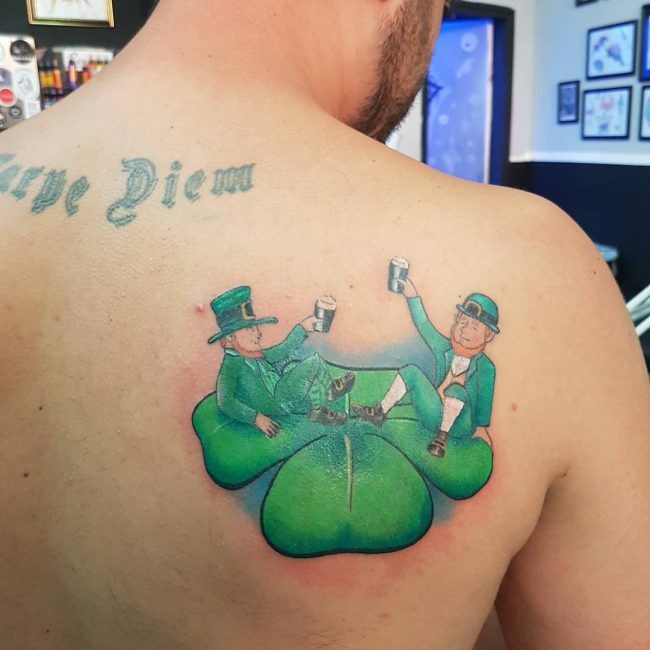 They believe that having the image tattooed on their body can make them win. 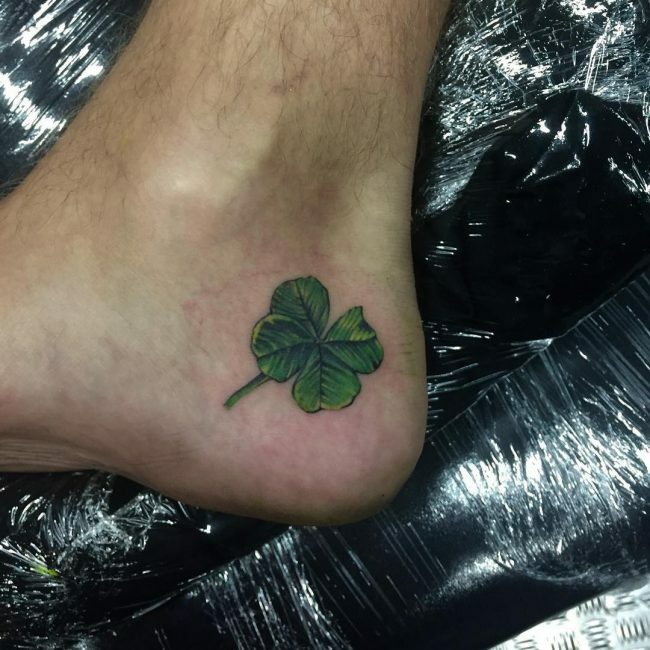 Here the image can be that of the leaf only or the whole clover. 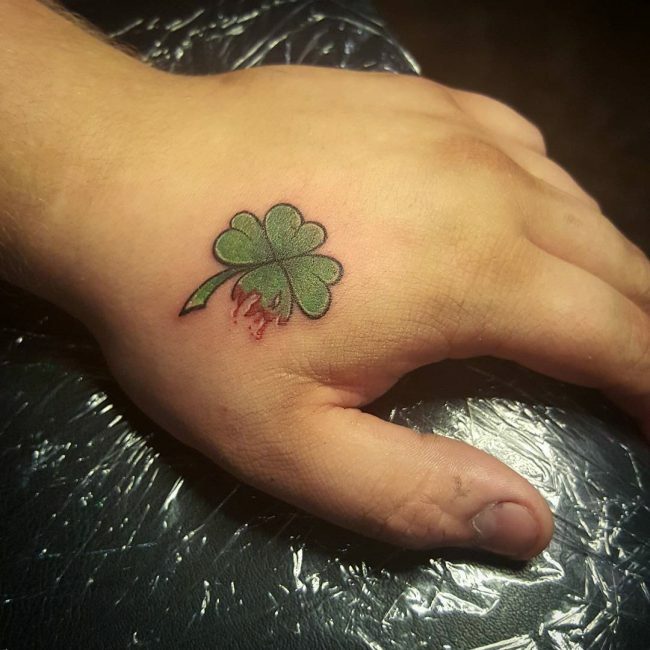 Other images such as that of the Lady Luck, money, dice, power chips and cards can be used to illustrate the intended purpose in the clearest way possible. 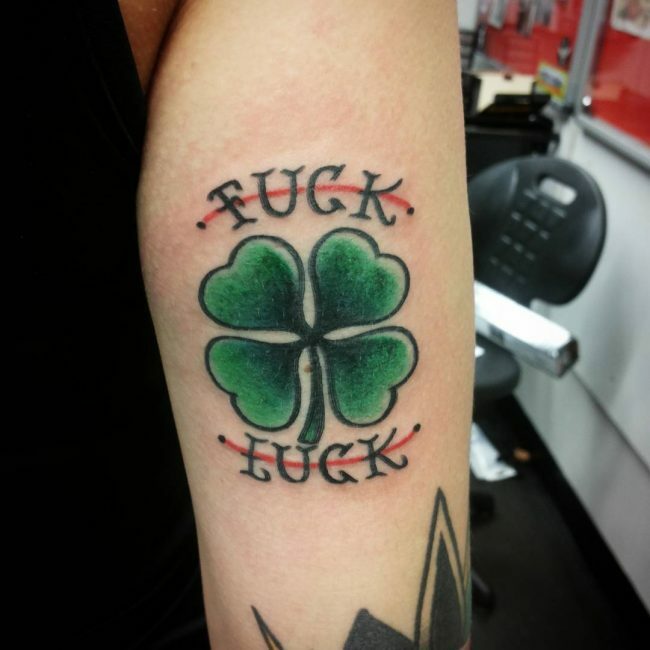 Men who participate in gambling love using this design and it is unwise to have it if you do not gamble because it might ruin your reputation, especially if gambling is not acceptable in your society. 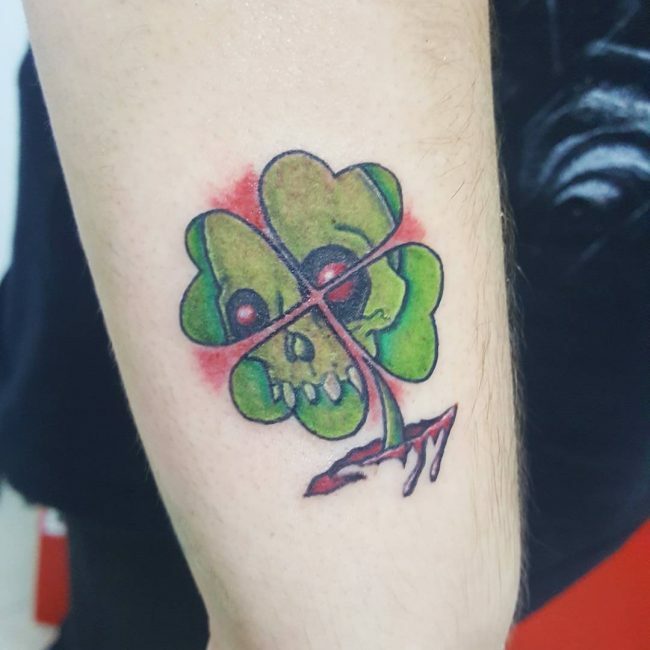 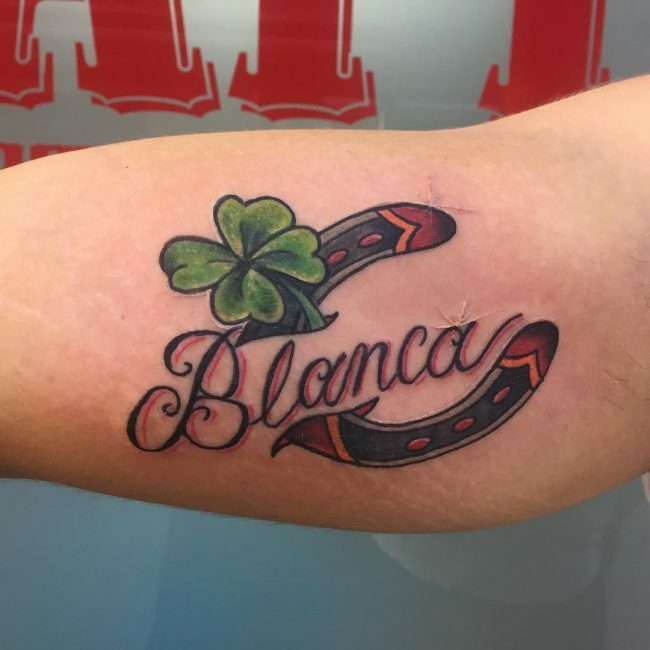 The Shamrock design: This design does not have too much detail, and only the person having it knows the intended meaning. 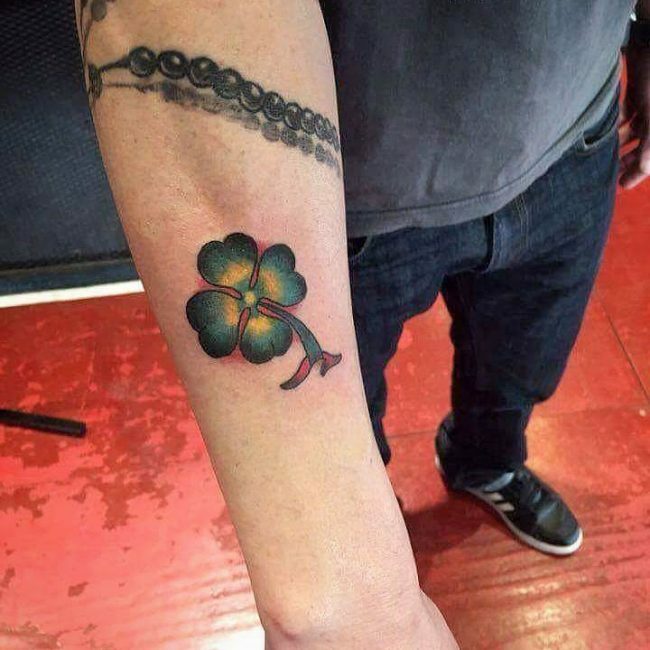 Here the tattoo may have the Shamrock plant as the main design or even include other symbols. 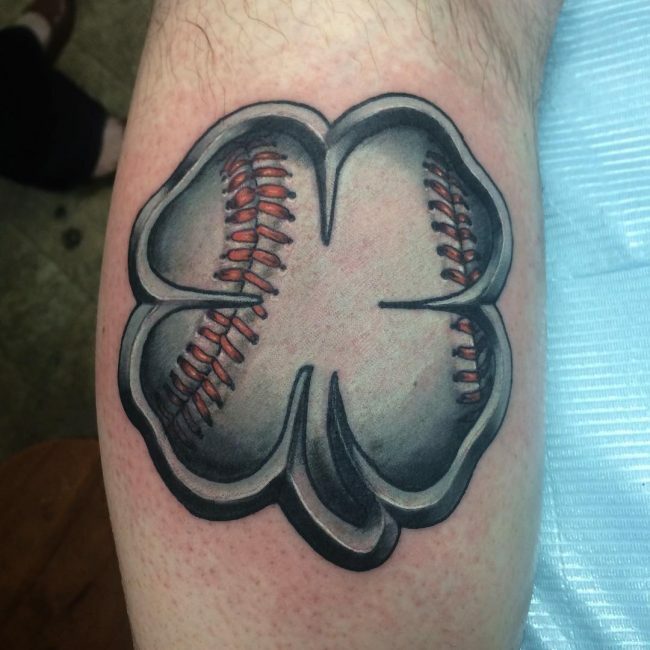 This design is normally used by men who what to have a tattoo with a hidden meaning only for themselves. 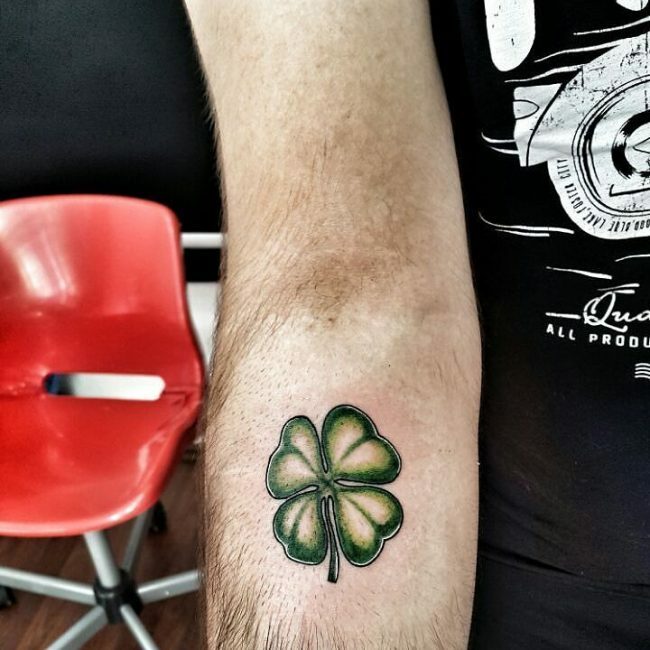 Saint Patrick day leaf clover design: This design is popular among Christian men. 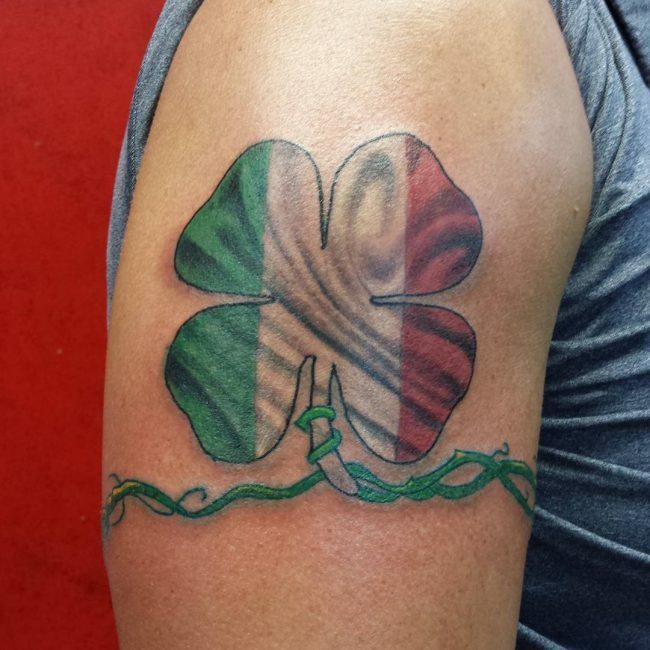 The image serves as the way of commemorating the day that Christianity was introduced in Ireland. 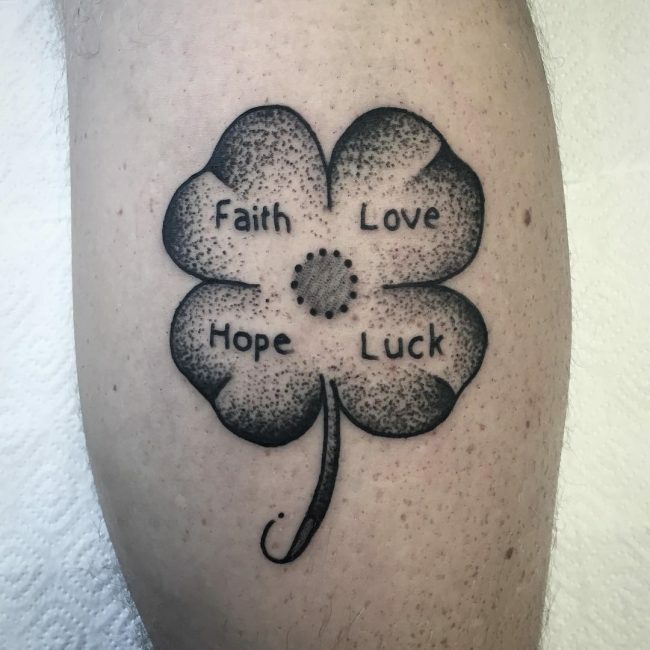 The design can also be applied as clover with number 13 on the top or just the clover only with the phrase St. Patrick Day. 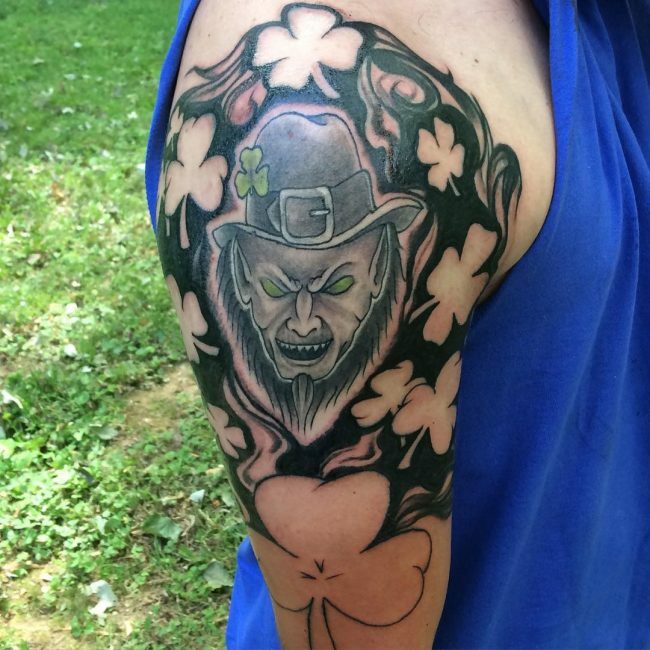 In many cases, Christian men use this type of tattooing to remind themselves of the great works of St. Patrick. 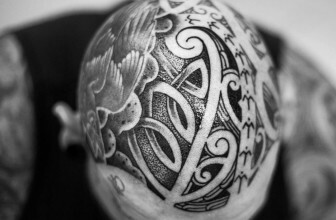 The tribal design: This is another commonly used design that comes with a special meaning that varies from one culture to another. 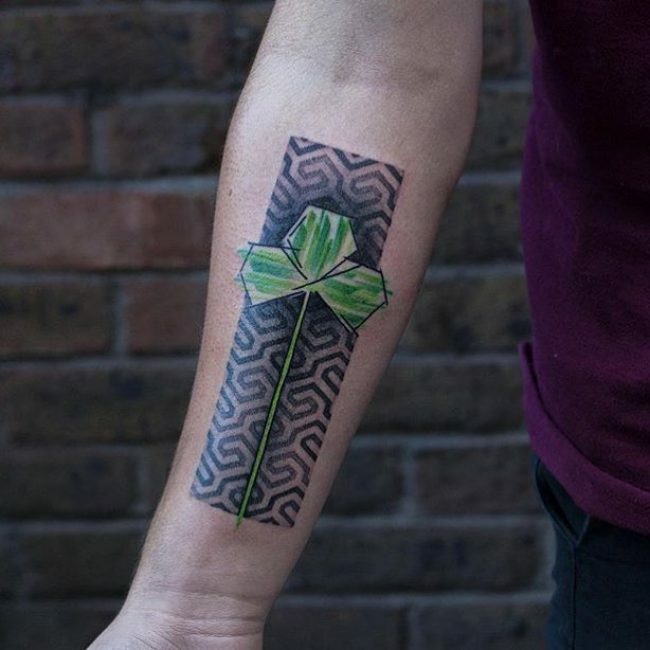 The design is used as a symbol of luck among the members of a certain tribe. 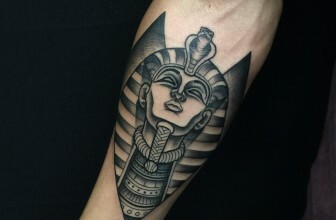 In many instances, this design includes other signs and symbols based on the culture of the person bearing it. 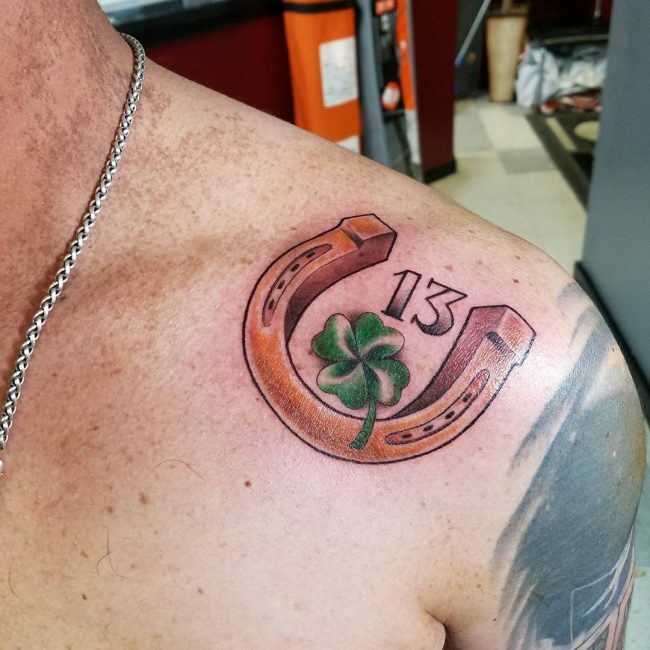 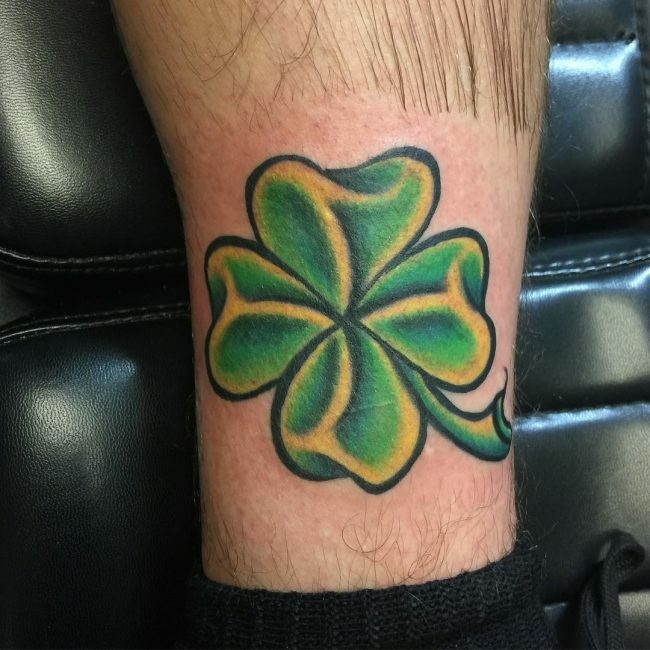 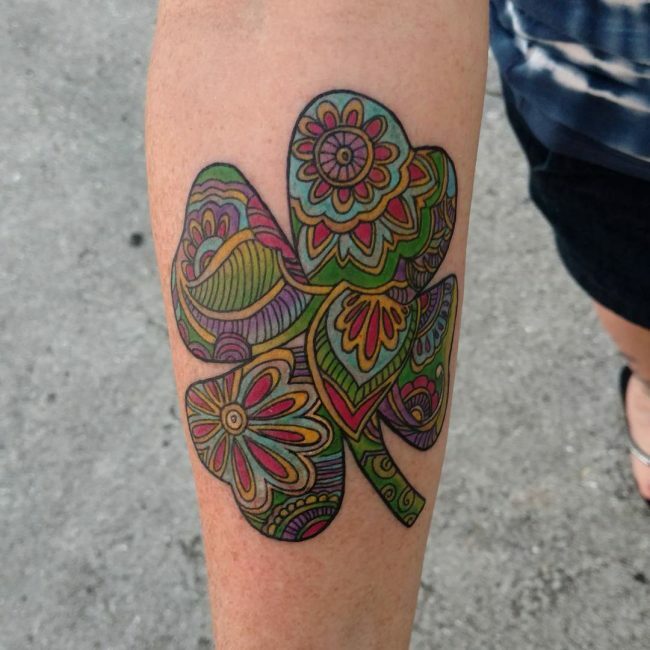 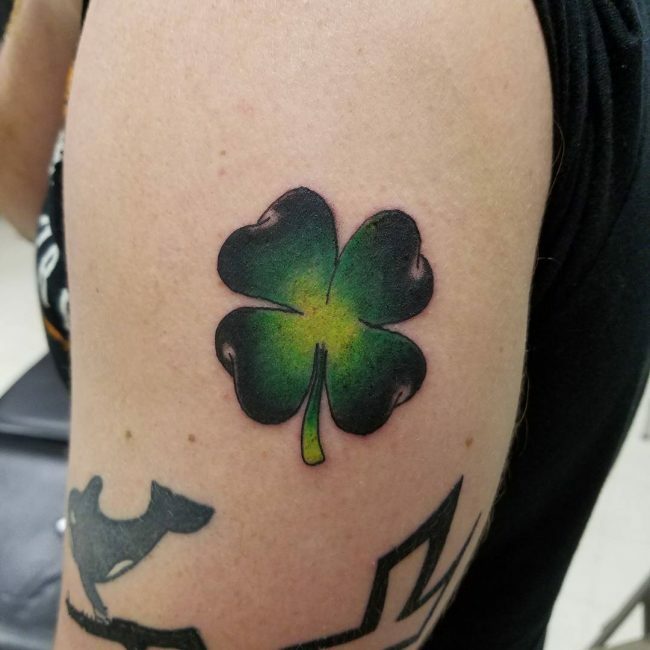 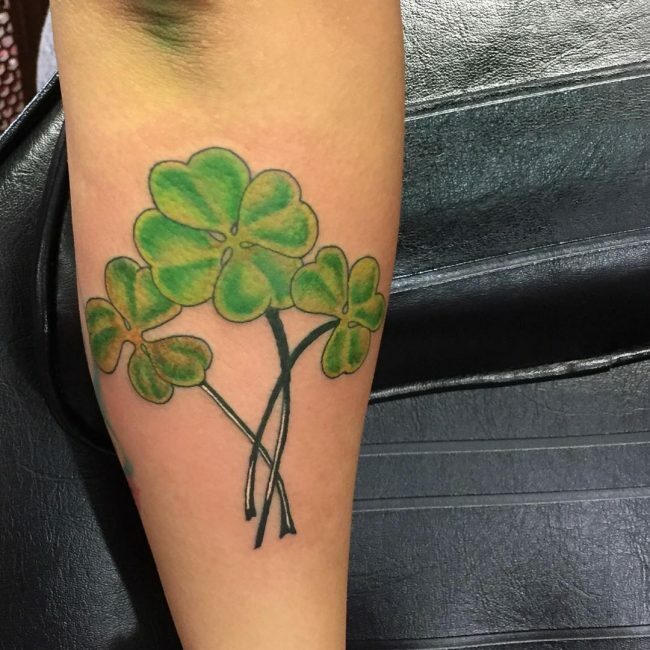 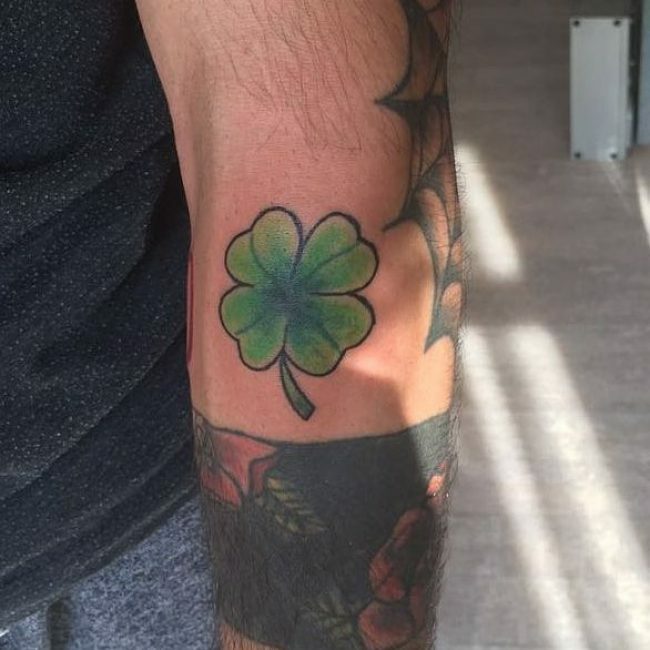 There is no doubt that the four leaf clover tattoo is a common design among men who want to- have images with positive meaning drawn on their bodies. 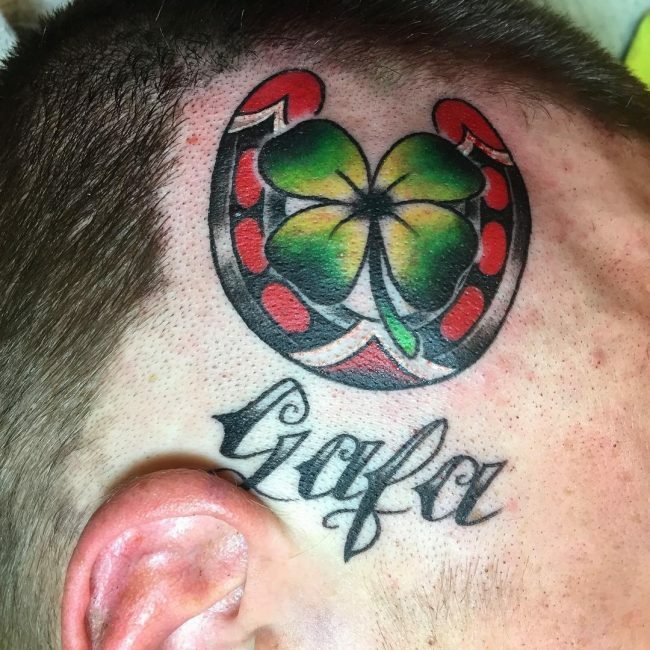 This type of tattooing comes in different designs that have different meanings. 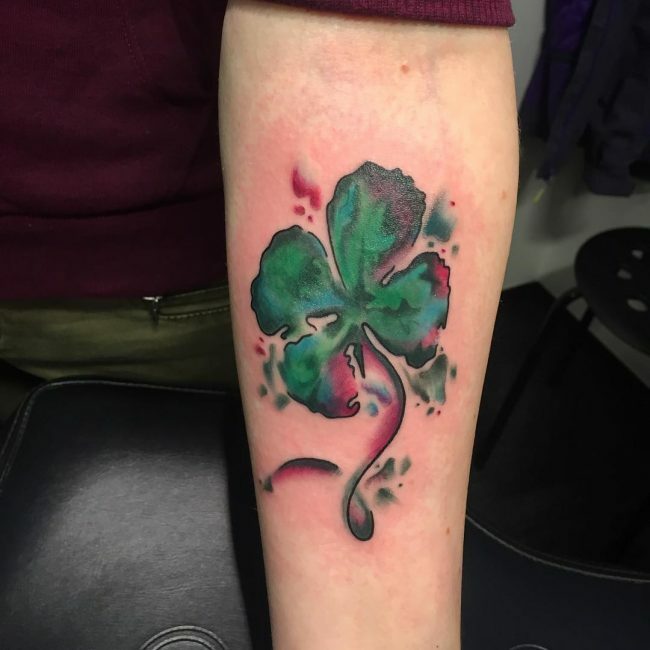 It is also worth noting that the design does not come with many restrictions and you can blend different colors to make your tattoo more appealing. 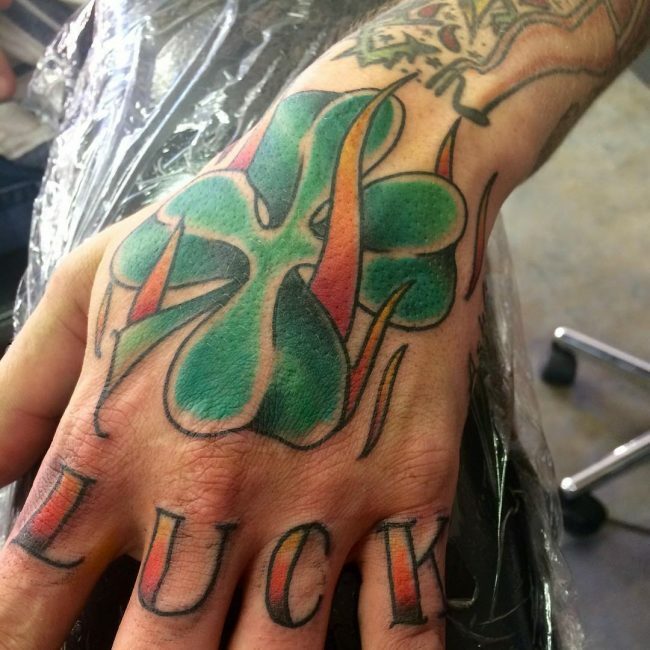 However, you need to find a qualified artist who is conversant with the design if you want to get good results.